There's a William Connelly buried at St Joseph's (Old Irish) Cemetery on 9 June 1883. There is a probate (Hamilton County) entry of 11 July 1883 naming Walter Granger as administrator of a William Connelly's estate. This entry indicates that William was killed by a train, and the probate proceedings were going to be suspended until a lawsuit, brought by Granger, was settled. So I checked for newspaper articles concerning the accident:. 7 June 1883 Times-Star note names William Connelly, age 70, living at 5th and Locke as being hit by a train. 8 June 1883 Cincinnati Enquirer article on page 6. Wm Connelly was struck at about 11:15 AM, and died at his home at Sixth and Lock at 3 PM. He had a wife and grown sons and daughters. He worked for the street cleaning department. He was age 72. 8 June 1883 Cincinnati Daily Commercial article on page 2. His home address was 187 E sixth, and was age 72. 9 June 1883 Times-Star reports that the coroner's inquest in the death of William Connolly will be held on Monday at 9 am. Pam Adkins acquired a copy of his death certificate. According to that, he died on 7 June 1883 of a railroad accident, was born in Ireland, was married, age 72, and resided at 187 E 6th St.
St Joseph's Cemetery lists the burial for a William Connelly on June 9, 1883, residence was 187 E Sixth, age 76, died of an accident, and he was from Galway, parents are Patrick and Mary. Despite the double entry for Mary, age 8, her age and the age of James agrees favorably with what is known. When Mary (then a Heaney) was buried, her birth place was listed as London on the cemetery records. If we ignore the ages of the parents, the ages and birthplaces of Mary and James agree with other information we have. John and Winifred aren't here anymore, suggesting death dates for them of between 1860 and 1870. This William is also living quite close to the Flannerys, where Anne is a daughter about James' age. Despite the destruction of the court records in a courthouse fire, a single microfiche was found that contains some journal entries concerning the lawsuit. Most of the image is unreadable, though some dates indicating some court activity can be read. So I used newspapers to see if the events of this case were reported. 11 July 1883 Granger named Administrator. Article found in Enquirer, 12 July 1883, page 6. $10,000 lawsuit filed. William killed on the 7th of June on Front street between Washington and Collard. 29 October 1884 Rules issued. Patrick Kennedy and John Collins are mentioned in the surviving court record. 24 November 1884 Jury sworn . Article in Commercial on 25 November 1884 announcing that the case was being heard. 25 Nov 1884 Some activity. From the Daily Commercial, 26 Nov 1884: "In the suit of WL Granger, administrator of Wm Connelly, against the Pittsburgh, Cincinnati, and St. Louis Railroad Company, a motion was made by defendants counsel that the jury be instructed to return a verdict for the defendant. The motion was granted"
26 Nov 1884 Some activity. Newspaper entry not found. 6 Dec 1884 Some activity. Newspaper article not found. 3 January 1885 Some activity. Newspaper article not found. 12 February 1885 Some activity. Newspaper article not found. 9 May 1889 Settlement reached ($200). Entry in Probate Court records found. Newspaper article not found. 27 May 1897 Motion to dismiss. Newspaper article not found. No further newspaper stories can be found, nor can other court records. I do believe, however, that a concerted search at the Clerk's office can turn up some of the records concerning this case. For an image of this entry ,click here, but be aware it is 547K large. This burial plot also contains Anne Flannery, Cornelius Flannery, and James Connelly, a three-year-old son of James and Ann Connelly. At the same time, a William Connolly was removed from the old cemetery and buried in the same lot. The grave he was removed from is the same as that shown in 1883 for "our" William. William Connelly is apparently the son of Patrick and Mary Connelly, and Mary Donnelly was a daughter of James and Winifred Donnelly; both are said to have come from County Galway. I can't say for sure whether William and Mary married in Galway, then left for England, or they met in England and married there. The spellings represent the possible variants that might be found in Irish records, and the numbers are the counts of families found in Griffith's (GPV) with that spelling. Notice the "Conneely" spelling (and pronunciation) and some of it's variants. Awareness of these variants is important for research in the records. By looking at the GPV, we can compile a list of those places (parishes and townlands) that contained both Donnellys and Connellys. This isn't any kind of a guarantee that William and Mary came from one of these townlands, but at least at the parish level there's a pretty good chance. 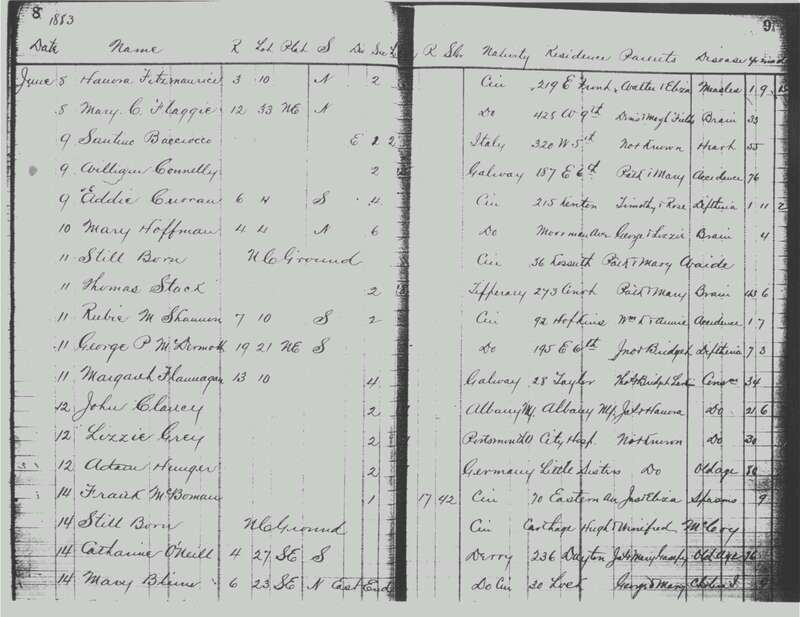 Two entries in GPV which are particularly interesting are a Winifred Donnelly in Kylemore, parish Ballynakill, and Trusky East in parish Rahoon which contains both a James Donnelly and a Patrick Conneely; Patrick and James are the given names of William and Mary's parents.